Every industry and different technical subject matter comes with it’s own lexicon of terms or vocabulary words. More often than not, when speaking to an Application Engineer here at EXAIR you are going to hear words within our lexicon. The list I have compiled below is merely a sampling to help translate some terms that we forget not everyone knows. Some of these are merely acronyms that get thrown around a good amount. SCFM – Standard Cubic Feet per Minute – This is the unit we use to represent the volumetric flow rate of compressed gas that has already been corrected to standardized conditions of pressure and temperature. PSIG – Pounds per square inch gauge – This is the unit which we use to represent the operating inlet pressure of the device. When requesting this, we generally are looking for a pressure gauge to be installed directly on the inlet to the device with no other form of restrictions between the two. For the most part, catalog consumption values are given in SCFM at 80 psig. The main exception to that rule are the Vortex Tube based products. Compressed Air – This is a utility that most industrial manufacturing facilities have available to them. It is regular, atmospheric air which has been compressed by an air compressor to a higher pressure than atmospheric. Generally speaking, compressed air systems will be at a range of 85-120 psig. OSHA – Occupational Safety and Health Administration – This is the main federal agency that enforces two of the major conformance standards that EXAIR products meet or exceed. 1910.242 (b) – This is the standard which states compressed air blow off devices cannot exceed 30 psig of dead end pressure. This means, if the exit point of the air can be blocked the operating pressure must be below 30 psig. The reason for this standard is to prevent air embolism which can be fatal. 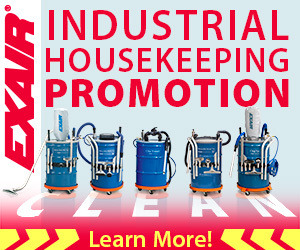 All EXAIR products meet or exceed this standard by having multiple orifice discharge. Coanda Effect – This is the effect that numerous EXAIR products utilize to amplify and entrain ambient air. The Coanda effect is when a fluid jet (stream of compressed air) tends to be attracted to a nearby surface. This principle was found by a Romanian aerodynamics pioneer, Henri Coandᾰ. The picture below shows a Super Air Amplifier blowing a foam ball into the air and suspending it due to the Coanda effect on the surface of the ball. 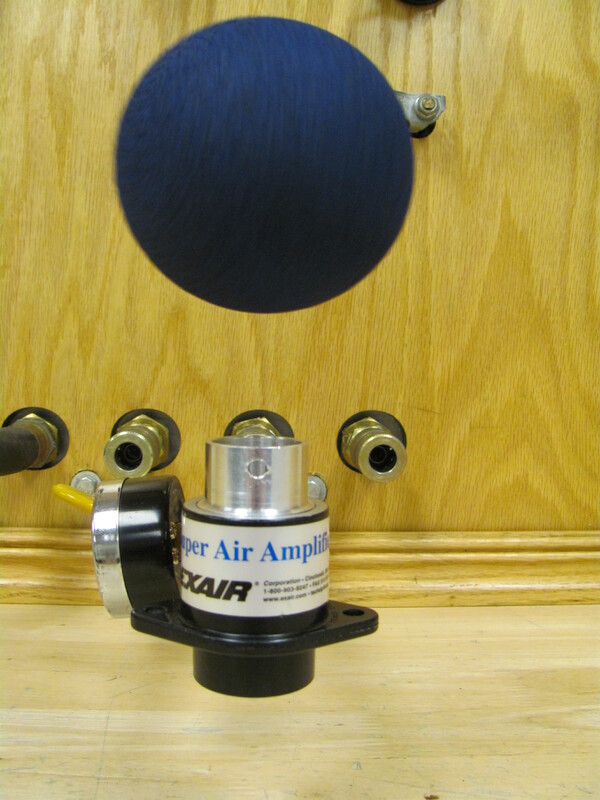 A Super Air Amplifier’s air stream causes a foam ball to be suspended in mid air thanks to the Coandᾰ effect. 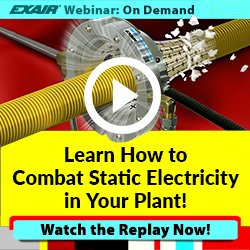 Rigid Pipe or Hard Pipe – This is the term we will often use when discussing the compressed air line that can be used to support and supply certain EXAIR products. Generally we are referring to a Schedule 40 steel pipe, Type L copper line, stainless steel tube, or any form of pressure rated hard pipe that can be used for supplying compressed air. Plenum – the state or a space in which a gas, usually air, is contained at a pressure greater than atmospheric pressure. Many of our products feature a plenum chamber. Again, this list is only a sample of the terminology you will hear us use when discussing compressed air applications. If there are any other air/compressed air/fluid dynamic terms you may be unsure of, please contact us. One of the most powerful, peculiar and perplexing products in the EXAIR catalog is the Vortex Tube. The medium sized vortex tube can generate up to a ¼ ton of refrigeration and still fit into the palm of your hand. It can generate cold temperatures that are 129° Fahrenheit below the input compressed air temperature, without any moving parts. It provides effective cooling on a wide variety of industrial systems like electrical cabinets, cutting tools, grinding operations, setting hot melt glue and a number of other cooling processes. The Vortex Tube is used in Cabinet Cooler Systems, Cold Guns, Mini Coolers and Adjustable Spot Coolers to utilize compressed air to create cold air for your application needs. The Vortex Tube uses a Ranque-Hilsch tube to create the cooling effect. This principle has been used since 1927 to generate hot and cold flows from a source of compressed air. For more information on the physics behind how the Vortex Tube operates, visit here. Our units are designed to operate at inlet pressures between 20-120 PSIG. The vortex tube comes in three different sizes, small, medium and large. The small unit will use between 2 and 8 SCFM of compressed air when fed with 100 PSIG of compressed air. It can be used with pressures much lower, but the change in temperature will not be as great. 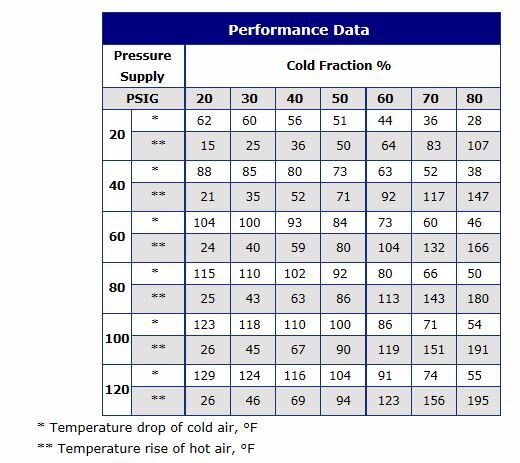 Below is a chart listing the temperature drops and rises of the vortex tubes with respect to supply pressure and cold fraction. The Cold Fraction performance chart shows temperature drops and rises for a Vortex Tube. To use Vortex Tubes intelligently, cold fraction needs to be defined. A cold fraction is the ratio of cold air flow to total air flow through the inlet of the Vortex Tube. This cold fraction is adjustable on the Vortex Tubes and Adjustable Spot Coolers, but it is preset on the Cabinet Cooler Systems and Cold Guns. Adjusting the cold fraction changes 2 variables with the Vortex Tube. First, it changes the amount of cold flow from the Vortex Tube. Second, lowering the cold fraction also lowers the cold air temperature. Flow and temperature will both determine the heat transfer of the system. For tool cooling operations, a very high cold fraction is used. If you have a tool that may be operating above 150 or 200° Fahrenheit, it will cool faster with more air flow at a higher temperature than air at sub-zero temperatures. For applications where the final temperatures are very low, below freezing or sub zero, lower cold fractions can be used. Find the blog next week to find out about what the addition of generators affects on a Vortex Tube.